The researchers have shown that methane flows can be detected and quantified from a range of sources, including a waste incineration plant and from sewage sludge.Gålfalk says that the camera can detect methane from a distance of around 700m, which would allow it to be carried in a helicopter to obtain data about methane emissions from sources such as forests or lakes over a large area in a relatively short time. 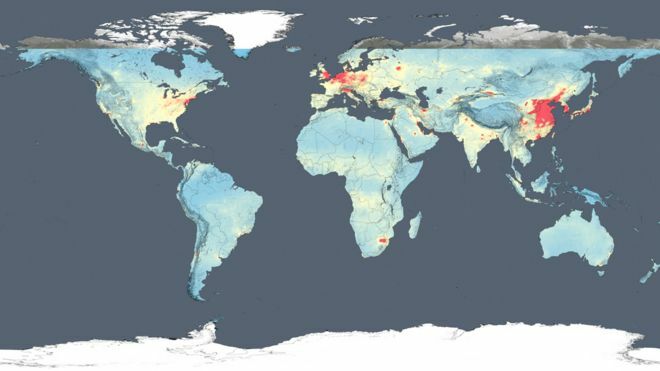 The success of clean air legislation in western developed countries is evident in the results from a 10-year study by a US space agency satellite. The Aura mission has been tracking trends in emissions of nitrogen dioxide since its launch in 2004. It has seen big falls in the pollutant in the US and Europe, while at the same time recording significant increases in some developing nations, such as China. Nitrogen dioxide is produced in large part as a result of the burning of fossil fuels. Key sources include the tailpipes of vehicles and the exhaust stacks of coal-fired power stations. The yellow-brown gas will, in the right weather conditions, promote the production of ground-level ozone, which is a severe respiratory irritant. Scientists working on the OMI instrument on Aura have analysed the whole period from 2005 to 2014, and have presented their findings here at the Fall Meeting of the American Geophysical Union – the world’s largest annual gathering of Earth scientists. In the US and Europe, which remain big emitters of nitrogen dioxide, they find there has been nonetheless considerable success in constraining the problem. Levels have fallen 20-50% across North America over the study period, and in Europe by as much as 50%. Environmental legislation is undoubtedly behind the declines, say the researchers, together with technology improvements that have helped scrub emissions. In a series of trend maps produced by the OMI team, the reductions are seen in blue. The reds, on the other hand, denote increases in nitrogen dioxide emissions. These are most obvious in developing nations. A good example is China and its northern plain, which has become a major global manufacturing hub during the OMI time series. “Nitrogen dioxide levels here have increased by 20-50% over the last decade. 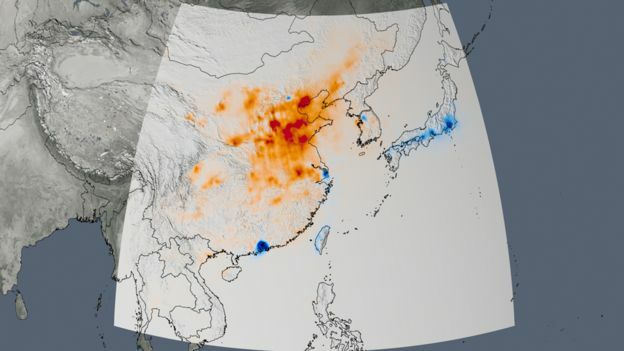 And the reason for this is that China’s economic growth is being fuelled by its cheap and abundant coal,” explained Bryan Duncan, an atmospheric scientist with Nasa. Dig a little deeper into the data, however, and anomalies become apparent. In China, some of the major cities have actually witnessed improved conditions. In Beijing and Shanghai, and in some of the cities of the Pearl River Delta, including Hong Kong, levels are down by up to 40%. Something similar is seen in southern Africa, where the Johannesburg-Pretoria metro area’s emissions have bucked the rising trend of more industrial locations on the Highveld, the country’s inland plateau. 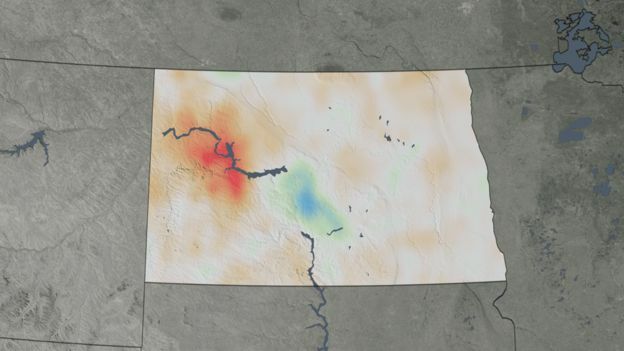 And in the US, the general trend of success is contradicted in regions such as Texas and western North Dakota, where oil and natural gas exploitation has seen nitrogen dioxide emissions rise. “What’s causing that increase? One is simply the heavy machinery – the trucks and all sorts of vehicles that are used in oil and natural gas extraction,” said Anne Thompson, another Nasa atmospheric scientist. The scientists displayed pictures from another satellite, Suomi, which captures night-time lights. It easily picks out from space this practice of burning off unwanted gas. The Middle East is an interesting case. 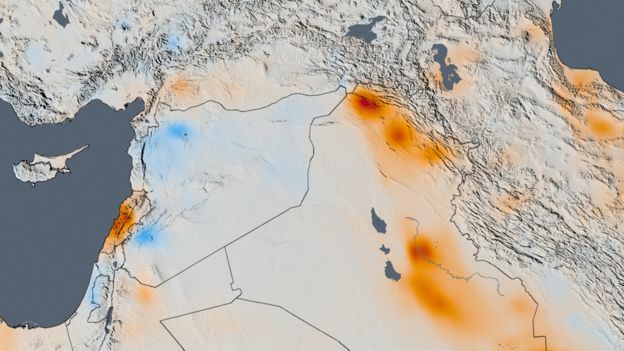 Post 2005, nitrogen dioxide increases are recorded in countries like Iraq, presumably because of economic growth picking up after the war years. Conversely, declines have been seen in Syria of late. Researchers put this down to the collapse of economic activity and mass emigration as a result of the country’s great upheaval. Corresponding spikes are seen in neighbouring nations, such as Lebanon and Turkey, where many of the displaced people have gone. Omi is actually a Dutch and Finnish contribution to Aura. 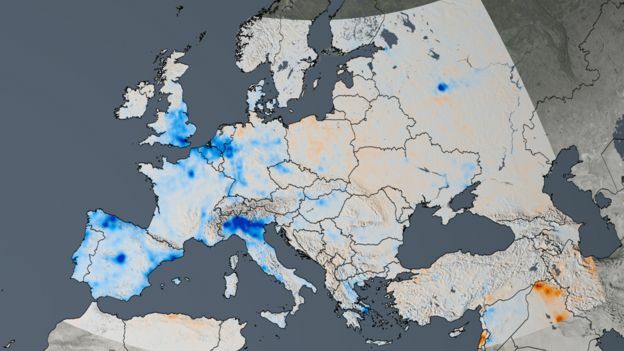 European scientists are already working on its successor – an instrument called Tropomi, or “Super-Omi”, which will fly on the EU’s forthcoming Sentinel-5 Precursor satellite.